This thread is being created for those who wish to see the ways that the two types of depth gauges were modified for use in fresh water and at altitude. In addition, I have enclosed the Cross Tables for "Theoretical Depth At Altitude for Given Actual Depths." This information comes from a conference I attended on altitude diving for the USAF in about 1975. --Cross Tables, "Theoretical Depth at Altitude for Given Actual Diving Depth in Fresh Water"--This table was developed by E.R. Cross to show the theoretical depth that should be used with the U.S. Navy Diving Tables for the actual depth (line measured depth) in fresh water. For instance, if I were to dive in Clear Lake, Oregon at a depth of 4500 feet, I would use the 5000 foot column at 100 feet, and that is the depth I would use for the U.S. Navy Diving Tables that are used at sea level. On this depth, I would have to use 120 feet in the U.S. Navy Diving Tables to get the correct decompression times for that altitude. 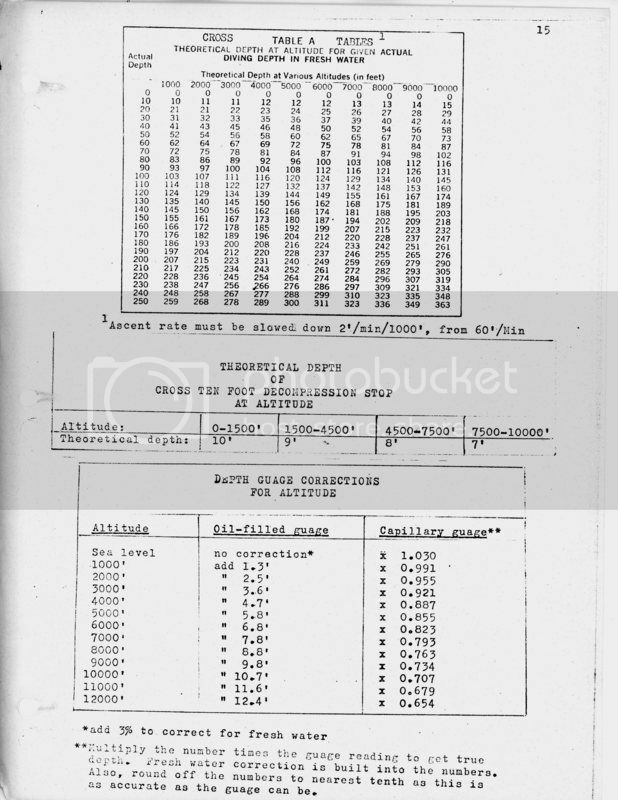 --"Theoretical Depth of Cross Ten Foot Decompression Stop at Altitude"-- For the above dive, I would need to modify the depths and at 5000 feet, the ten foot stop would be at 8 feet actual depth (see below for depth gauge corrections). I hope this little thread helps with those who are using vintage gear in fresh water at altitude. Great info. Nice to have the formula instead of these on line calculators that just output an answer. 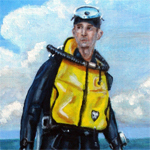 The dry suit came first. Then the wet suit. Then colors! then it just all fell apart, plastic gear, fashion colors, cats and dogs living together. The beauty of a capillary depth gauge is that it is altitude adjusted and reads in fsw no matter what fluid your diving in. At the surface, the tube is full of atmospheric-pressure air even at altitude. When you have doubled that pressure at whatever depth, a capillary gauge will read 33 ft. This is perfect for entering into dive tables that are designed to work for dives in sea water. The drawback of a capillary gauge is that is really hard to read precisely at deeper depths. If you create a capillary gauge that reads your actual depth in fresh water, you then need to correct to fsw to use dive tables. All depth gauges are really pressure gauges. For decompression considerations, your actual depth is not really important. What is important is the change in pressure relative to atmospheric pressure at the surface. Bourdon-tube gauge readings do require corrections to enter most dive tables. The ffw capillary was just one part of the overall project. I wanted to make a converted table / gauge set to remove as much on site conversions of information as possible. Not so much for decompression but more of a square profile repeat shallow water dive table. Years ago I had made my own crude dive planner work sheet for high altitude 02 diving. It was simple and based on the duration limits of the gear I was using at the time. Your pointing out that a depth gauge is just a pressure gauge calibrated to read in feet just got me thinking about a gauge / table set that works and reads in pressure only. Essentially a universal table that works in fresh / sea / altitude as the gauge reads max pressure attained and the table calculations work on time exposure at that pressure level. Right now it's all in the "thinking about it" stage. I have not done any real number crunching on this project. There are a couple of references I have about making your own capillary depth gauge. They are pretty easy, but don't have the tubing in a straight line like your example does. They use a plastic rectangle, and have it taking several turns to make a doubled rectangle, with depth markings on the outside. But you could use both sides, and have one calibrated for salt water, and one for fresh water. But none of them are for altitude diving. You would need to use the calculation, or give one on another set, for the altitude you are diving. Realize that if you use the numbers on the capillary gauge, you will automatically adjust for altitude, as Charlie is stating above. have one calibrated for salt water, and one for fresh water. But none of them are for altitude diving. You would need to use the calculation, or give one on another set, for the altitude you are diving. Realize that if you use the numbers on the capillary gauge, you will automatically adjust for altitude, as Charlie is stating above. Do you mean that the capillary gauge adjusts for altitude by virtue of the fact it is nothing more than an open ended tube? However the reading it gives in feet will be off as the gauge is calibrated at sea level pressure? Like I said to Charlie, I've only been thinking about this. No hard math yet. Also mentioned that a simple and universal table set could be based on pressure readings. Not depth. All tables and computers run there math on time and pressure. Then it's converted to feet for our simple minds to understand. If you cut out thinking in terms of feet and used a pressure gauge reading and a pressure based dive table set it would work in fresh water, sea water and altitude. Here is what I mean. If you imagine the capillary gauge as an absolute pressure gauge, you would have the weight of the atmosphere (atm) on top of the weight of the water. But it is showing zero at sea level, as it is out of water until you put the gauge underwater. As you go down in depth, the pressure builds, until at 33 feet (10 meters) you are at twice the surface pressure, or 2 atm absolute pressure. The water will have traveled up the column half way. At 66 feet (20 meters) you are at 3 atm absolute, and the water will have traveled up the column 2/3 of the way (leaving only 1/3 of the original amount of air. From this you can get an idea of the relationship, and this is at sea level. Now, let's say you go to altitude. There, the absolute pressure is not 1 atm at the surface. It is some percentage of one atm, depending upon how high you are in the air column. But as you descend, the water still weighs as much as it did at sea level (assuming fresh water, not salt water). So the pressure of the water column will remain the same, but it will start with less air density. This will cause the capillary gauge to read deep. So our true depth is about 66 feet, rather than 80 feet. If I use the 80 feet on the depth gauge with the U.S. Navy Diving Tables, than I am being conservative, as I was not to that depth. Now, another way that the capillary depth gauge will read deep is that it uses the air, usually at surface temperature. But lake waters, especially Lake Tahoe at depth, is much colder. So that will also cause the capillary gauge air to contract, resulting in an additional error in depth, reading deeper. So there are two factors happening with the capillary gauge, altitude and temperature, which will cause it to read deeper, and give you a "conservative" reading for decompression purposes. Therefore, we would need to use 90 feet when determining no-decompresssion limits or decompression stops. This is not "conservative," and could lead to a diver who doesn't know the difference to use a shallower decompression schedule than the actual depth needed for this dive. On top of that, because it is in fresh water, we need to add an additional 3% to this reading. So in addition to the 87 feet, we add 3 more feet to get 90 feet of actual depth for this dive, that was reading originally on this type of gauge 80 feet. ...If a tank 33 feet deep is filled with sea water, the pressure on one square foot of surface area on the bottom will be equal to the weight of the column of water above it. This column may be thought of as a stack of 33 1-foot cubes of water each weighing 64 pounds. The total weight would thus be 33 x 64, or 2,112 pounds, acting on 1 square foot of surface area. Since there are 144 square inches in a square foot, the pressure on each square inch in this case would be 2,112/144, or approximately 14.7 psi--1 atmosphere of pressure. This is the pressure exerted by the water above. The air above the water is exerting an additional 14.7 psi of pressure, so the absolute (total) pressure at the depth of 33 feet is 29.4 psia, or 2 atmospheres. Each additional 33 feet of descent will add an atmosphere (14.7 psi) of pressure. The absolute pressure exerted on a submerged body is the pressure of the water plus atmospheric pressure. Each foot of descent increases the pressure by 1/33 of 14.7 psi, or 0.445 psi. This figure is a very useful one to remember. Multiplying the depth in feet by 0.445 gives the water pressure at that depth in psi. Adding 14.7 psi to this gives the absolute pressure at depth. The U.S. Navy Diving Manual goes on to say that fresh water weighs 62.4 pounds per cubic foot. Sea water therefore exerts 1.026 times more pressure than fresh water, and thus the corrections for depth for a Bourdon tube depth gauge. Since there is this difference, we need to do a slightly different calculation. 33 ft/atm salt water x 62.4 pounds/ft3 of fresh water = 2059.2 pounds / square foot. 2059.2 pounds per square foot / 144 square inches per square foot = 14.3 pounds / square inch. But an atmosphere is 14.7 psi, so we need to divide that by 14.3 psi to get a conversion factor for fresh water. 1.028 is the correction factor for converting the pressure to one atmosphere in fresh water. So to make the capillary gauge specifically for fresh water, the half-way point of the water column should be marked at 34 feet, and not 33 feet. By the way, this is so much easier in the metric system. I may do this via metric later, if I find the time. OK the long version is easy for me to understand. When you made that short response I truly could not make heads or tails of what you attempted to say. I clipped off everything but your comment on the metric system. Much as I hate the system if for no other reason than my brain is conditioned to think in feet and psi, it is more simple just because everything is in units of 10. And every 10 meters = 1 ATM 0r 1 BAR if we want to be super picky on a couple of kilopascals. Anyhow I keep thinking about avoiding as much conversion of info as possible. Lending more to not thinking in terms of feet but in absolute pressure. Oddly enough that pretty well describes the metric system.